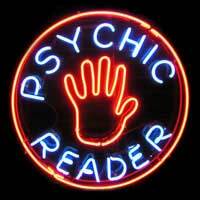 Home > Psychic Hoaxes > What is Hot and Cold Reading? The search for proof of psychic ability is an ongoing one and while the presence of fraudulent psychics does not mean that there is no such thing as ESP, for example, it does mean there are people out there who would prey on their fellow man by pretending to power. These frauds are typically very skilled and talented people and one of the methods they use to deceive is Hot and Cold Reading. Hot and Cold Reading involves reading potential targets, gathering information in a clandestine manner and then using that information to fool the target into be believing the reader had some form of ESP or clairvoyance. Reading a person can be easier than one might imagine; in fact, people do it all the time. When having a conversation with a colleague, it might become apparent that the listener desperately wants to be somewhere else. She is nodding and smiling and responding to the conversation, but her feet are pointed away from the speaker, her arms are crossed over her chest and her eyes occasionally dart towards the door. The observant will put these signs together and let her be on her merry way, having successfully read the signs. This is just one way a purported psychic will read a target in order to better deceive. A “Hot” reading is one that is done beforehand, giving the psychic foreknowledge that he or she pretends not to have. An accomplice visiting a home and observing the homeowner to have small owl figurines prominently displayed will relay this information to the psychic, who may then make a statement to the target like, “I get the feeling you like birds…especially nocturnal birds.” The target will be amazed and likely cop to the truth, “Yes! I love owls!” The psychic has now been validated as far as the target is concerned as having mystic powers. A “Cold” reading is one done with no foreknowledge, but instead relies on the psychic’s powers of observation and the ability to make deductions Sherlock Holmes style. Taking note on how a person dresses, their carriage, the way they respond to certain categories of questions and their body language can tell an expert a lot about a person’s lifestyle, point of view and education. Cold reading is a larger discipline than Hot Reading, which simply is gathering information in advance. Cold reading covers asking leading questions in such a manner that the person answering gives credit to the psychic for paranormal knowledge. General statements made to an audience full of people hoping for proof of the psychic can be exceptionally effective in finding a target. “I sense someone here has lost a loved one to cancer” will likely generate a number of hits in an audience of a large enough size. There are a lot of groups that use Hot and Cold Reading and not all of them are psychics. Faith healers of the televangelist variety are often accused of using these techniques and magicians and mentalists certainly use them. A number of popular magicians hold entire shows using these techniques but don’t reveal until the end what they are doing, showing the audience how easy it is to dupe them into believing the magicians were using psychic powers.